Articles appear in chronological order: NOTE: links to articles will open in a NEW browser window so the Library page remains active. You may need to disable your pop-up blocker. Interviewed by Margaret Heidenry for an article entitled, "How to Build a House Cheap: 7 Sneaky Ways to Save on Home Construction" which camps onto my firsthand experience of designing and serving as the gen'l. contractor for my own casa. You can view my quotes here or view the .pdf in case the link moves. Interviewed by Leah Ingram for an article entitled "12 Things You Must Do to Sell Your Home in Winter" -- my quote is the first one in the gallery which is accompanied by photos (although here's the actual hue "Greenery, Pantone's color of the year I referenced which is a far more clear and saturated green than the one pictured in the stock photo she chose). FYI, I had also referenced in my reply to her a recommendation for one of Benjamin Moore's 2017 colors of the year as an option too, Shadow (a smoky, sultry plum), as well as suggesting anything in the orange family as on-trend and a potential help re: creating the all-important curb appeal. You can view my quote here or view the screenshot in case the link moves. Interviewed for Realtor.com (ranked in the top 150 websites in the U.S.) for an article entitled "Tired of White? 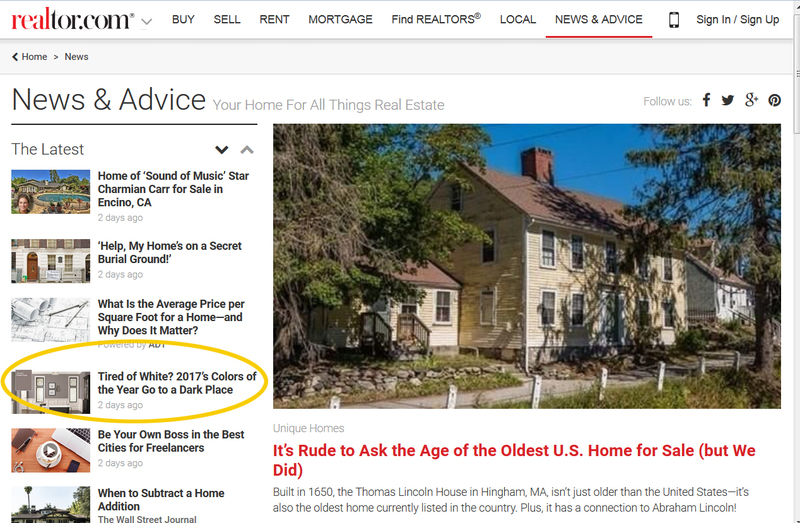 2017’s Colors of the Year Go to a Dark Place" which was featured on their News homepage, and two of the four photos used in the article were mine: a black bathroom belonging to a client for whom I suggested the darkest of dark hues plus my own formal dining room. You can view the article here or view the .pdf in case the link moves. Interviewed for Realtor.com (website for the National Assoc. of Realtors) for an article entitled "11 Budget-Friendly Staging Ideas That’ll Wow Buyers" by Margaret Heidenry -- these were excerpted from a staging article with DIY type tips I'd previously written for a local office of Coldwell Banker. You can view the article here or view the .pdf in case the link moves. Interviewed for Bed Bath & Beyond's blog for a post entitled, "How to Merge Your Partner’s Taste With Yours" by Bonnie Gibbs Vengrow. You can view the article here or view the .pdf in case the link moves. I wrote a series of articles for The Union (Nevada County), one of the oldest newspapers in California, founded in 1864 (!). 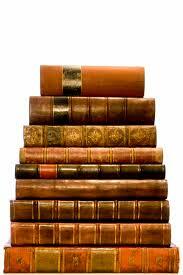 Below are the first 8 of these -- and for my most recent articles, please click here. (2/13) "How to fall in love...with your house!" A Valentine's Day inspired bit of encouragment to feather your nest YOUR way. (1/23) "Drip-dry decorating" -- part 2 of a 2-part article on materials that hold up to the elements: fabrics & furnishings. (1/16) "Drip-dry decorating" -- part 1 of a 2-part article on materials that hold up to the elements, first up: flooring. (12/19) "Area Rugs 101", a primer of do's & don'ts for this key design element. (12/5) "ASAP Guestroom Makeovers", houseguests are a-comin'! (11/14) "Fast Fix-Ups for under $100", just in time for the holidays - time to get busy! (11/7) Part 1 of 2: "Tackling one of the trickiest home design challenges: scale", something I've observed homeowners struggle with for years. (11/21) Part 2 of 2: (Scale continued) "Right-sizing your furnishings" -- understanding how to apply key principles of proportion. Interviewed for Bed Bath & Beyond's blog for a post entitled, "How to deck your windows." You can view the article here or view the .pdf in case the link moves. Interviewd for an article in the publication's Frugal Shopper column entitled "Tricks to Saving More Money This Fall -- Picking the right decorations on a budget can be a challenge." You can view the article here or view the .pdf in case the link moves. Interviewed for an article entitled "Here's how to help your staircase rise to the top" for a nationally-syndicated column. You can view the article here or view the .pdf in case the link moves. Interviewed for an article entitled "10 DIY Projects For Your Kitchen" (NOTE: TheStreet.com was co-founded by CNBC's stock guru, Jim Cramer). Article appears in the Main Street portion of their site. You can view the article here or view the .pdf. Interviewed for an article entitled "Rugs to Unify Your Rooms" for a nationally-syndicated column. The article was only available online for a short period of time so you can view the .pdf. For an article entitled "Close the sale on your home with these 5 simple makeover ideas," the journalist who interviewed me selected multiple excerpts from a longer article on staging I'd written for a Coldwell Banker publication. You can view the article (including the slight boo-boo re: my business name), or view the .pdf. Interviewed for an article entitled "How to Choose an Interior Designer" for FoxNews.com (for the second time in as many months). My comments highlighted the commission orientation of MOST designers/decorators to help inform and alert consumers to this aspect of a relationship with a potential designer they're considering. You can view the article here or view the .pdf. Authored an article entitled [The] "Transformative Power of Color" which utilized before & after photos of a Broad Street client's 1880's Victorian re-do to illustrate various properties of color in design. The article was featured in The Union's Home & Garden section. IF you have an online subscription to The Union you can view the article online here or you can view the .pdf. Interviewed for an article on FoxNews.com entitled "Best colors to paint your kitchen" -- see quote in lead paragraph plus under the paragraph heading "Brown." You can view the article here or view the .pdf. Interviewed (for the third time) by Sheree Curry for her column on AOL for her article entitled, "If Donald Trump Made the Big Move." I am one of three interior designers quoted in the article and my comments appear toward the end in this piece which is mostly tongue-in-chic (!) and is intended as a follow-up piece re: my participation in her earlier article requesting designers critique President Obama's redecorating of the Oval Office. You can view the article here or view the multi-page .pdf. 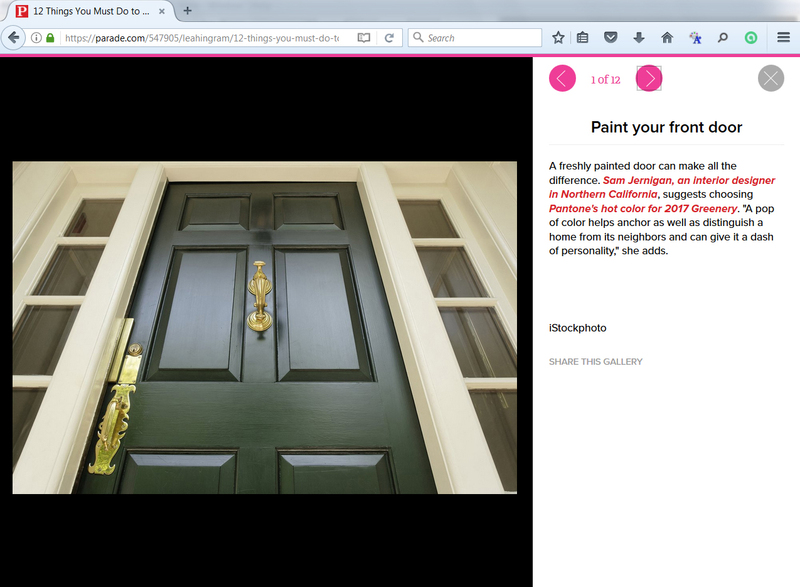 Interviewed for an article entitled, "A Guide to Painting Accent Walls." So many people get it wrong when trying to implement this concept so I was happy to help out with a couple of my own guidelines. You can view the article here or view the .pdf of the article. Interviewed (a second time) by Sheree Curry for her column on AOL for her article entitled, "Obama's Oval Office: Redecorating the World's Most Famous Rental." My comments appear throughout the article although I was SORRY that I disliked the results of the presidential designer's efforts. You can view the article here or view the multi-page .pdf. Interviewed for a nationally syndicated article by Chicago Tribune writer, Leslie Mann, entitled, "Setting Your Sights on the Right Site" (and distributed to over 100 newspapers nationwide). You can view the article here or view the multi-page .pdf. And you can learn about my own staging background here. Interviewed for decorating tips on paint for a March 2010 article for the National Home Furnishings Association, the nation’s largest organization devoted specifically to the needs and interests of home furnishings retailers. (NHFA’s membership comprises 2800 corporate entities representing 10,000 stores in all 50 states.) The article entitled, "Easy Room Transformations: 5 ways to improve your room with just one easy change," appears in the "LEARN" department on their consumer website: www.HomeFurnishings.com or you can view the .pdf of the article. Wrote featured article "Saving the planet, one home at a time" for the Nevada County Contractors Assoc. Fall '09 Home Improvement Guide. Learn about more eco-minded products available for your home - especially helpful if you're building or remodeling. Read the article (.pdf edited to just the cover and my 2-pg. article so as to streamline view time). NOTE: complete 23 pg. Fall edition of the Home Improvement Guide is available on TheUnion.com. 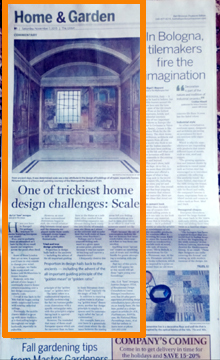 This feature article on the front page of the Auburn Journal's Home & Garden section profiled Renaissance Design Consultations. The article ran in the 12/11/2008 edition of the paper. Here's the link to read it online OR the .pdf (in case the link moves). Interviewed by Senior Consumer Reporter, Kelli B. Grant, for SmartMoney.com (the magazine of the Wall Street Journal) for their "Wallet Pop" feature on AOL Money & Finance. Here's my section of the article entitled "Top 5 Ways to Spruce Up a House for Under $50", or click here to read the full column which also includes comments from two HGTV design show hosts. Interviewed for article which appeared in Home section of various regional newspapers including: Auburn Journal, Roseville Press Tribune, Colfax Record, et al. "Getting Cozy: Use color, lighting and furniture placement to warm up a room"
Interviewed for article which appeared in the Nevada County Contractor's Home Improvement Guide for Homeowners. Profile of client Nancy Lindberg -- preconstruction planning of new custom home. In years past, I mailed a complimentary newsletter I wrote/produced to my clients. Four pages in length, normally these were sent out once a year. I was often delighted to hear clients refer to these as "keepers," indicating they saved these mailers which probably resulted from the fact that I always made a point of [at least trying!] to include useful and practical information that could be referred back to as needed. Most of the material therein was usually not "time-sensitive," but instead highlighted basic design principles. Each issue also featured a "Renaissance Recommended Resource" in which I would introduce my clients to locally-owned businesses specializing in various home furnishings products. 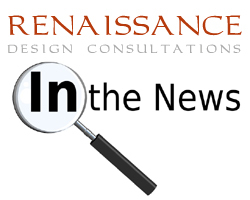 Spring, 2006 - the FIRST newsletter since transplanting Renaissance Design Consultations to the Sierra foothills. 2018 Remodeling COST vs. VALUE REPORT - January 2018 report, Sacramento region. This detailed analysis is commissioned annually by the National Realtors Assoc. -- check out the payoff for WHICH projects you're considering for your home (hint, you have to go all the way to the LAST page of the report to view the actual dollar figures). See the results of this comprehensive survey gauging dollars recouped upon selling for specific home improvement projects. Color trends, 2018 - here are some key color directions for interior design from the leading manufacturer of premium architectural paint, Benjamin Moore. And here too are the 4 top 2018 Colors of the Year from the Color Marketing Group who advises industries & manufacturers annually on key color trends -- Enjoy the inspiration! New idea for "temporary art"
Careful care will preserve wood furniture." Knight Ridder, 4-page article, highly detailed and helpful tips on keeping your wood pieces in good health and looking their best. Copyright 2005 - 2019 Renaissance Design Consultations, all rights reserved.